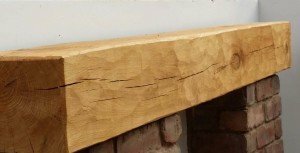 Our Oak Fireplace beams and fire surrounds are cut from solid English Oak and can be custom made to your dimensions and requirements. They are usually cut from green oak which is relatively easy to work and finish. e surface perpendicular to the length of the beam following its passage through the saw. These beams can be supplied with a light machine Adzed to bring out the beauty of the grain.The Adzed finish a very old carving method and is not common with other beam providers. In addition we can create chamfers or carving to your specification. 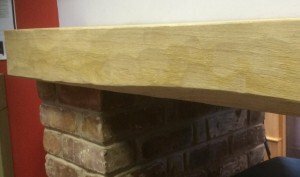 The beauty of the beam is particularly enhanced if it is then waxed, we recommend Treatex brand, and can provide this at a small extra cost. 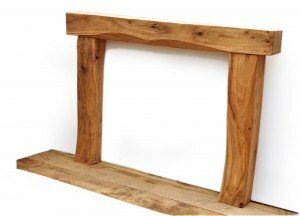 Our hand cut effect Oak Fireplace beams are sculpted to give more organic appearance and can be cut into the upper middle for an ascetically pleasing appearance. These beams will usually be supplied with one straight surface to fit to the wall where it will sit. We can put a smooth top on which extenuates the rustic face.